Snake Remover, snake removers, reptile handlers. Emergency snake removalists in all suburbs, Melbourne, Victoria, Australia, Professional Emergency snake remover, reptile handlers. For the removal of your problem snake/s. (Snake removal by an unlicenced reptile handler is illegal in Australia. It is risky to attempt to capture or kill a snake if an inexperienced reptile handler). 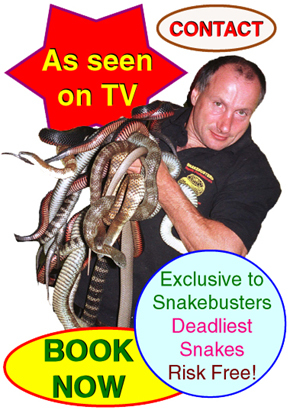 Snakebusters® are licenced professional venomous reptile handlers and snake removers. Don't take risks - call "the Snake Man"! 24 hours a day to all Melbourne suburbs and nearby areas! (See: Our terms and conditions). Shows in schools, kindergartens, scout groups, etc, exhibitions, consulting, expert witness for court proceedings, etc. Melbourne's Snakes - Definitive paper by Raymond Hoser. ... unauthorised use, dilution, infringement, etc is prohibited, including phrases we use for which we also own trademarks. Emergency venomous snake removers, professional snake catcher and dangerous venomous snake catching and professional reptile handlers and reptile control in Melbourne, reptile handling, reptile handlers, Victoria, control, reptile handling and reptile handler, Melbourne, Victoria and snake remover. © 2015, Snakebusters®. All rights reserved. snake removal, information about snakes, professional snake removers in Melbourne, reptile handler Melbourne, Emergency Venomous Snake Removal and reptile handler and reptile catcher, Melbourne, and in Melbourne as a snake remover.